The U.S. Botanic Garden is a museum with a difference - our artifacts are the living treasures of the world. As a living plant museum, our collections, including plants, their leaves, flowers fruits and labels should not be removed or disturbed. We invite you to return again and again, to watch us grow and see our ever-changing exhibits. Admission to the U.S. Botanic Garden is free. The Conservatory and National Garden are open every day of the year from 10:00 AM until 5:00 PM, and the National Garden has extended evening hours staying open until 7 p.m. from Memorial Day until Labor Day. Bartholdi Park is open every day of the year from dawn till dusk. Take advantage of our Plant Explorer's Field Journal for an educational and fun experience. Ask for a Junior Botanist kid's backpack of exploration, for ages nine and above. Obtain a wheelchair for use around the Conservatory. We also have a balloon-tire wheelchair for outdoor use in gravel areas in the National Garden. Find out details on upcoming tours and special programs and events at the U.S. Botanic Garden. Visit our Hours and Location page for opening hours and directions. The U.S. Botanic offers a wide range of exhibits throughout the year. Find out what's on right now and what's coming soon. Visitors are permitted to take photographs of the public areas at the U.S. Botanic Garden for personal use only, and must be taken with hand-held cameras. Commercial use of such photographs is strictly prohibited. Hand-held film cameras, video cameras or lap easels for sketching may be used at any time, as long as they do not affect the public's enjoyment of, or access to, our exhibits. For permission to use tripods, easels or art material containing solvents during the week, please reserve a permit in advance by contacting Laura Anthony. Reserved permits are obtained onsite at the Visitor Information Services desk in the Conservatory. We do not allow visitors to do photoshoots or videoshoots at the Garden. Please read the full Photography and Art Policy for more details. There are no dining facilities at the U.S. Botanic Garden. Many months of the year, we install tables and chairs on the Conservatory Terrace, in the National Garden and in Bartholdi Park, and we invite you to bring lunch and enjoy being outdoors. The closest dining options are located at the National Museum of the American Indian, the Rayburn or Longworth House Office Buildings or the Capitol Visitor Center. In addition, restaurants can be found on Third Street SW, near the Federal Center SW metro station. There is no gift shop at the U.S. Botanic Garden. Nearby gift shops are located at the Capitol Visitor Center, the Library of Congress and the Supreme Court. Please read more about them at Visiting Capitol Hill and to learn more about other places of interest across Capitol Hill. The U.S. Botanic Garden facilities are not available for rental for weddings or other private functions. Policies governing Congressionally sponsored events are established by the Joint Committee on the Library. For more detailed information, please contact Laura Anthony. 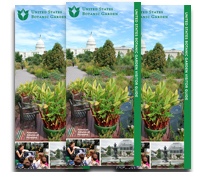 Read about the U.S. Botanic Garden before you arrive! Our visitor guide is available in English, Arabic, Chinese, French, German, Italian, Japanese, Korean, Russian, and Spanish.